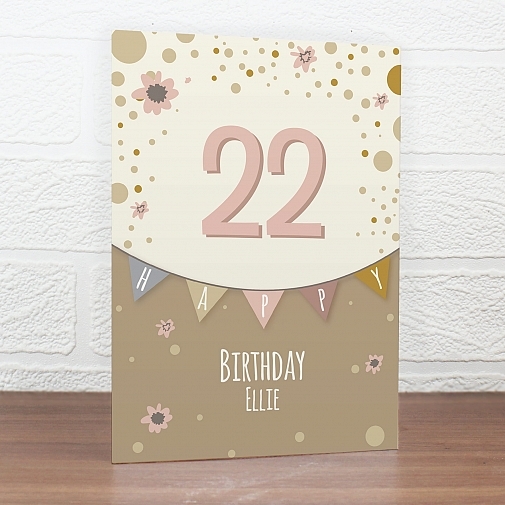 Our charming Personalised Rose Gold Bunting Card is an ideal surprise for Birthdays or anniversaries.The front of the card can be personalised with a number and 2 lines of text, with up to 25 characters per line. The inside of the card can be personalised with 5 lines of text with up to 25 characters per line.Please note that all text will appear in block capitals.All cards come in a brown outer envelope with a plain white envelope inside. Our cards measure 185mm x 132mm.Our great value cards include free standard delivery.Card orders received before 1pm will be dispatched the same working day.Ideal for Birthdays, Anniversaries.